Fans of the Angry Birds franchise, Rovio just released a teaser of the upcoming Angry Birds Seasons update for iPhone and iPad. This time around, the new chapter is all about Summer, with loads of evil pigs to destroy. At this stage, not much is known about the new levels, but it is safe to assume that the new version of Angry Birds Seasons will offer fifteen additional levels, new (Easter) eggs, and new achievements. Angry Birds Seasons Summer Edition will come as a free update to the Angry Birds Seasons app, which already features Halloween, Christmas, Valentine’s Day, St.Patrick’s Day and Easter themed levels. 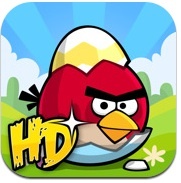 Note that thanks to this new update, Angry Birds Seasons should offer a whopping 130 levels. Angry Birds Seasons Easter Edition could be out as early as next week, but if you simply can’t wait, you can already buy the game from the App Store, since the update will be free for the owners of the game.